What do these symbols do? Sorry to ask such a basic question but can anyone tell me what these two symbols do? 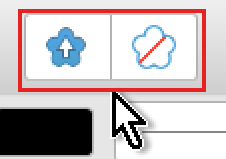 If you hover your mouse over them you should get the basic explanations, "Synchronize defaults from selection" and "Revert Defaults". They are shortcuts to the menu Edit > Defaults > Synchronize from Selection and Edit > Defaults > Revert. Synchronize defaults from selection—the default settings are updated to those of the currently selected object. Revert defaults—synchronized defaults are reverted to saved defaults. If an object is currently selected, its attributes revert to the default settings. So, basically, the first one lets you change the default settings to match those of a selected object (things like stroke, fill, color, font size, ...). The second one lets you revert all the synchronized defaults to the saved default settings (from Edit > Defaults > Save) if no object is selected, or lets you revert just the attributes of a selected object. I'm still in the experimenting stage with the defaults myself, so I can't really say more at this time. The curse of nomenclature. For "Defaults" I read "Preferences". Say you usually want filled rectangles to be red with no stroke so you can see them clearly. You may change the colour and or shape, etc. later. Draw a red rectangle with no stroke. Edit > Defaults > Save will save that "default" globally for all future rectangles in the current publication and in all future publications (not just the one you are working in). You don't mind this because most of the time you want your starting rectangles to be red. That's just the way you are. But, if you want your rectangles to be another colour in this pub, you can change the default for this publication only by changing the colour of one rectangle, selecting it and clicking the LH Lotus, i.e. "Synchronise defaults to current selection". Subsequent rectangles in this publication only will be the new colour. To revert back to your global default (preference) for rectangles, click the RH Lotus, i.e. "Revert synchronised defaults back to saved defaults". Each new publication will always open with your saved default, in this case, red. It is a GLOBAL or persistent default unless you change it and save it, or revert back to factory settings under Edit > Defaults. Thanks. To be honest, I discovered good info in the AF Pub HELP file under "Defaults > Object Defaults and > Toolbar". There seems to be good stuff under "Preferences", too. At least for newbies like me.